I often tell people that Erik and I fell for each other because we share two very important passions: fitness and food. We love foods of all kinds and eating a variety of cuisines. We love wine tastings, craft beer, traveling and tasting exquisite cuisine. We watch a lot of Food Network, and he’s an amazing cook. (I try.) And I love him for all of this. Food is so fun. But so is fitness, and for us, the two go hand-in-hand. In fact, fitness is how the two of us initially connected. A very long story short, several years ago I didn’t know what I was doing (or trying to do) in the gym. Erik offered to help me and eventually started training me. He taught me how to lift weights, do the right type of cardio for fat loss, and he motivated me to pursue a career where I found a passion I never knew existed. Erik became my accountability partner, he helped me achieve my goals, encouraged me to take my dreams to the next levels in my life, and in the end? The happiness and confidence I found in myself had transferred to our relationship. I was making him better. He was making me better. 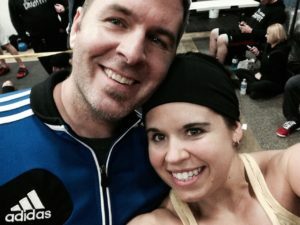 What are the Pros of Working Out with Your Significant Other? 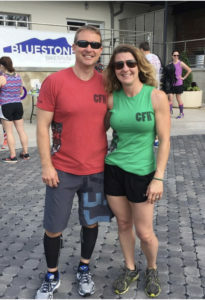 Exercising with your partner allows couples to make connections with one another that they may not otherwise find. Lifting together or running side-by-side, even throwing wall-balls simultaneously creates a “non-verbal matching behavior” which can benefit your health and relationship. Couples tend to feel bonded and more emotionally attuned to one another. When couples exercise together, they’re both sharing the goal of getting healthy and prioritizing their fitness. Not only does sharing one another’s goals bring you closer as a couple, but it automatically sets you both up for a greater chance at becoming successful in reaching your goals. When couples care about one another, they’re much more likely to lend support to one another’s goals. Couples who support each other with health and fitness goals tend to be happier, healthier, leaner, and more emotionally bonded. And sharing fitness goals such as lifting weights together (date night at the gym?) boosts the quality of the romance between couples! A study in Prevention Magazine found that 94% of couples stuck to their workout plan when they did it together. What better way to stick to your health and fitness goals when your accountability partner lives with you (or sees you most every day)?! Plus, it’s really hard to back out of a workout when your other half is at the gym waiting for you! For me, this is huge. I never found a reason to skip the gym when I knew I’d spend that hour or two with Erik. And at home, Erik knows when I’m cutting back on sugar or if I’m trying to meet a protein goal each day. We don’t come home with junk from the grocery store because we know the other one is there to say “WTH are you doing? 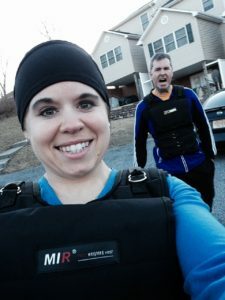 !” We plan out the same “pizza nights” and we food prep our healthy meals together on Sundays. We know each other’s fitness schedules (if we can’t workout together) and we make sure to prioritize the other’s person’s gym-time. I’ve been in relationships before where I prioritized health and my partner prioritized fast food and soda. Guess what didn’t last?! I mean…when you’re both feeling sexier because of your shared goals, emotional bonds, the exercise you’re doing together, those endorphins that already feel amazing will shoot your love life through the roof! Training as a couple means you’ll feel happier overall, feel more confident in your body, and the combination of all of these components equals a pretty intimate relationship. And many reports also show that couples who exercise or compete together in physical challenges feel more satisfied in their relationships and more in love with their partners. The physiological arousal of the exercise oftentimes drives romantic attention towards one another. Exercising together means a date together every day. Lifting, running, laughing, chatting about life and work, spotting one another, getting close…talk about the ultimate bonding experience! Working out with your other half means you get to schedule time on your busy calendar for one another–and the gym. In a world of meetings, long work days, errands that need to be run, picking up and shuffling kids from one event to the next…life can get hectic. If you and your significant other are both prioritizing your health–you get to improve your fitness and your romantic life all at the same time. Psychology has consistently shown that performing an activity in front of others affects your ability to do said task. I’m not going to lie, I will work twice as hard at the gym if I know my husband is watching. I will push harder to reach that new back squat PR, and I’ll run faster if he’s watching the clock. And I’m pretty sure he feels the same. Working out with your partner can bring about healthy competition that includes playfulness and flirtation–some of the relationship elements that get lost among the day-to-day business of life. Once again, surprise surprise–the two of you create a close-knit bond that not only enhances your relationship but improves your fitness. StrongFigure Bootcamp offers a discounted rate for all additional family members who sign up under the same household. To visit our membership options, CLICK HERE! Not sure what to do with the kids if you’re both coming to bootcamp? StrongFigure Bootcamp is a family friendly environment. We want to create healthy households and give parents the opportunities to be role models for their children. Bring the kids with you so that they can see mommy and daddy swinging those kettlebells side-by-side! What do you say…is your relationship ready for some new thrills? Are YOU ready to improve your happiness? Health? Confidence? Intimacy? Sign yourself and your partner up today! !